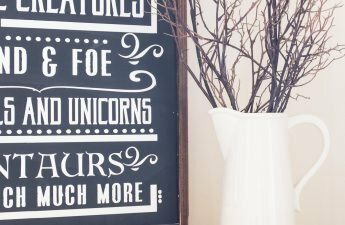 DRUM ROLL PLEASE….. this is the post where I divulge some of my major sign making secrets!!! 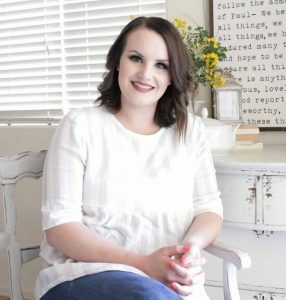 If you don’t know, I ran a successful sign shop for 3 years before recently quitting to blog full time! I have tried about every which way possible to make signs over the years making literally thousands!? ?and today I’m gonna give you all the details!! Thoughts on “COPYING” dun dun dun…..
As a part of the maker community which I love and adore by the way, I know we hold our “maker secretes” ?close to our hearts. ?I knew I wanted to wait until I had stopped making and selling signs to share this post because I still kind of feel like I’m showing you my deck of cards but lets get real for 2 seconds shall we?!!! 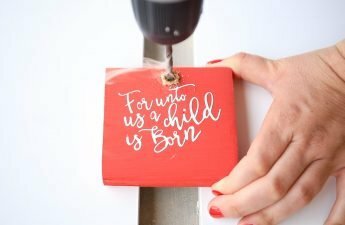 There are a MILLION and one ways to make signs, and there are already tutorials all over Pinterest ?sharing exactly what I’ve captured in this video right here. I have become close friends with many other sign makers and the thing I’ve found to be the most true as that while some of our processes are similar they are still vastly different! What works for one of us totally fails for another!! ?I think we get a little afraid to give away our best ideas because we fear the idea of imitation. Truth is there is only one YOU! and the chances that anyone could ever replicate your exact success through imitation or ?create your specific brand out side of making a real good dupe of your work is about zero! With that said if you are looking to start selling handmade signs I truly believe there is room for everyone! 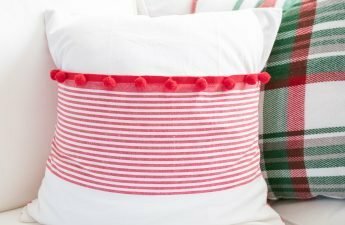 I encourage you to do your research and look for quotes that are not plastered all over Instagram and Etsy and do something truly unique! Selling signs for 3 years afforded my little family so many opportunities that would have never been possible without my shop! ?If you work your hiney off you can surly make a name for yourself and be successful! You will find even greater joy and success knowing you did it by being unique and not following the crowd! I’m going to break out of the mold and share with you my process!! This was so fun to film and I hope enjoy this video! I know I’ve mentioned it before but I’m so excited to incorporate video into my tutorials! There is so much that gets lost in translation when you share just a picture of how to create something. 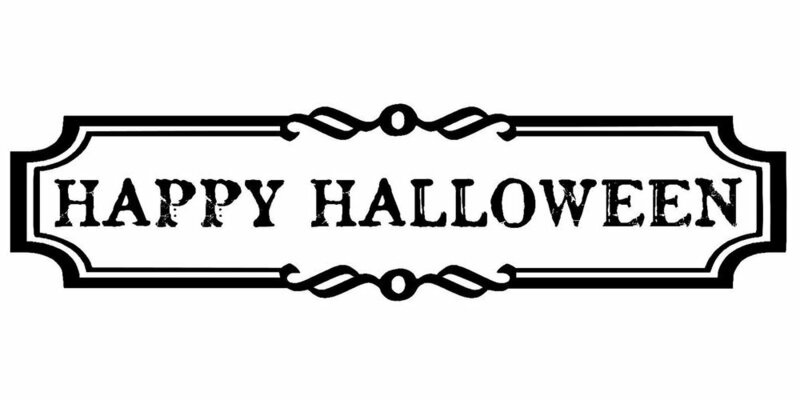 Video captures what still images can’t so go out there and make some awesome signs OK?!! and be sure to subscribe to my YouTube channel so you don’t miss out on what i’m working on!! Here is the official video!! and below is my suggested supply list! 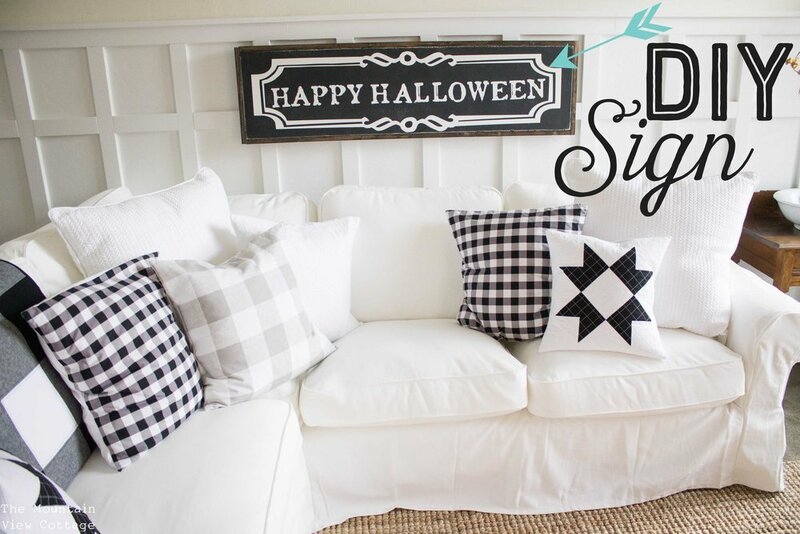 these are tried and true items that will make your life so much easier when you go to make your first sign!! Or perhaps will help you succeed if you have tried and failed in the past! 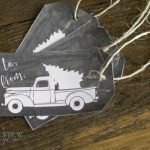 If you are not ready to invest in a cutting machine there are lots of shops on Etsy that will create vinyl templates for you and you can purchase a single stencil instead! Unfortunately there is not a way for me to upload the file I used from my silhouette program here! 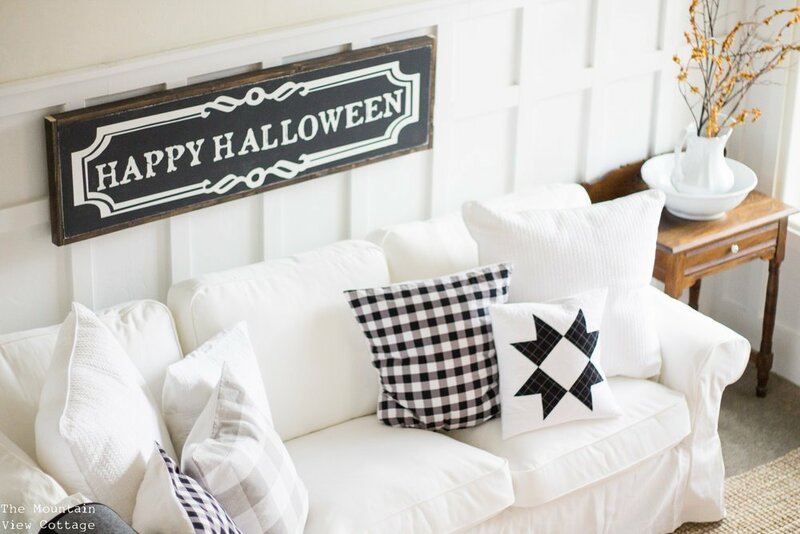 but this is the image of the original design I created and you can trace it through the silhouette software to create your own farmhouse inspired Happy Halloween sign! I ask that you use it for personal only and not recreate it for sale or monetary gain. 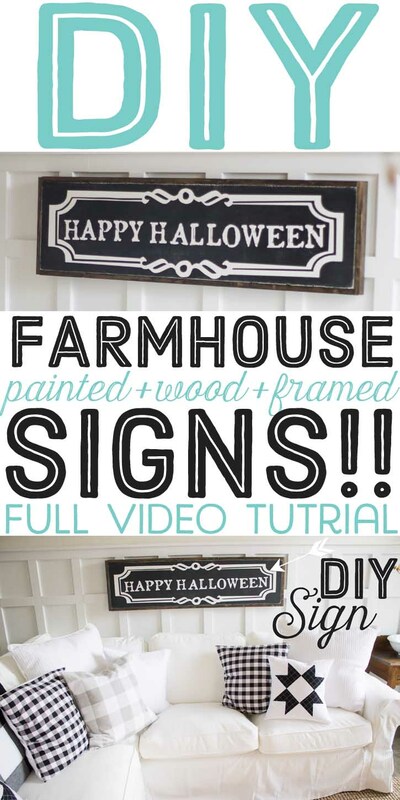 I hope you found this farmhouse inspired sign tutorial useful and if you happen to make a sign using this process tag me on Instagram I would love to see your creations!! If you would like to save this tutorial for later be sure to pin on of the images below! I’d love to know what type of vinyl and where you get the vinyl and transfer tape…if you don’t mind. ? Hey Natalie I use oracle 631 vinyl for most all projects! But I have also linked all the specific products used right in this post! I hope that gives you more information! thanks so much for your comment! Hey Haley, thanks for being so generous with your tips. I loved watching your process. I think maybe some of the links for products used didn’t post properly. I am also curious what type of transfer paper you use, but there isn’t a link available in the post. Transfer paper is my number one enemy right now, so if I could find a good replacement that would be awesome. Thanks again. Loved it. 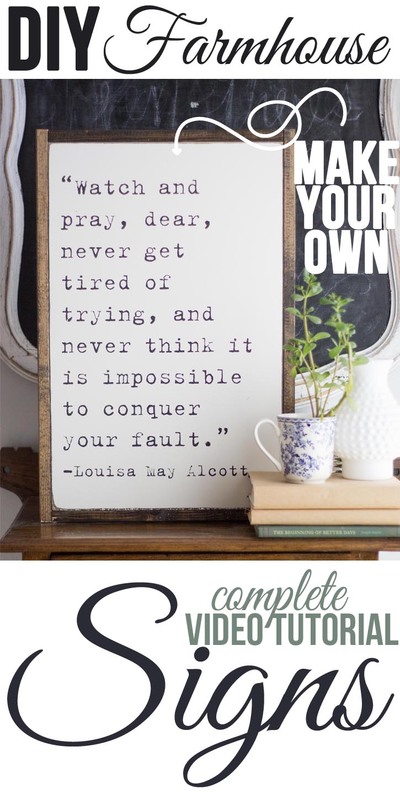 Do you have one that show’s how to do the Louisa May Alcott one? Thank you so much for the video, so fun to watch the whole process!! I love the ‘distressing’ part. 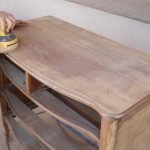 What is the grit number of the sand paper you used with the electrical sander? what brand/ type of pain do you use? im having trouble with the vinyl peeling the paint underneath it off. thanks for sharing! Just wondering – do you use any type of sealer/polyurethane after the painting is finished? Thank you so much. I really needed to read your thoughts on copying. The struggle is real. It is a form a flattery but frustrating as well. So thank you for the pick me up! With that being said, I am unable to find your link for the transfer tape. Could you possibly post it again? Hi! I was wondering what brand of paint you use? I love making signs too! Thanks for sharing your tips! I am wondering what font you used for the Louisa M. A. sign? Did you follow the same steps for that sign? I love your video and signs! I think your links to your supply list have come undone though. I was hoping to find out where you ordered your 631 and transfer tape. I am working on my first sign right now using your directions. I have a few pieces of 631 left from years ago that I am doing my trial with. If all turns out well, I want to order a lot more. Is there a link to what kind of transfer tape and vinyl you use? I am having trouble with vinyl taking off the paint underneath, as well as the transfer tape (using the kind that Cricut sells) taking off large chunks of paint! I use Green Star Transfer Tape found on amazon it looks like masking tape. and 631 Vinyl from sign warehouse I hope that helps! Some times however the type of paint you use can be the issue I find that chalky type paint works best or a flat latex indoor paint! best of luck! Do you use plywood?? Do you feel like it keeps a smooth surface to work with?